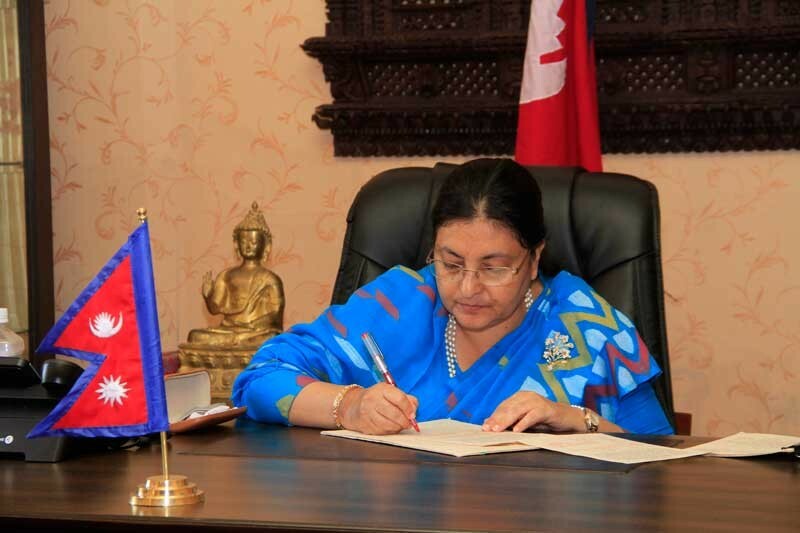 File Photo: Nepal President Bidhya Devi Bhandari. Amid pressure from several quarters, Nepal President Bidhya Devi Bhandari on Friday authenticated the much-awaited ordinance on National Assembly election, paving the way for the formation of upper house, Kathmandu Post reports. According to President’s aide Bhesh Raj Adhikari, President Bhandari signed the ordinance shortly after holding a meeting with CPN-UML leader Subas Nembang and Prime Minister and Nepali Congress (NC) President Sher Bahadur Deuba. According to Article 86 of the Constitution, a 59-member National Assembly will formed. The Electoral College consisting provincial assembly members and chiefs and deputy chiefs of local units, will pick 56 out of the 59-member NA. The President will nominate three additional members, including one woman on the recommendation of Cabinet. Nepal President Bhandari, in a meeting earlier on December 29 morning, told PM Deuba that she will authenticate the ordinance to fulfill her responsibility as the disputes over the modality of electing National Assembly members could not be resolved through consensus. She made the decision to sign the document after holding deliberations on the ordinance with political leadership and legal experts, Adhikari said. The ordinance was put on hold at the president’s office due to the dispute between the ruling Nepali Congress and largest party CPN-UML over the modality of electing upper house members. The stalemate over the upper house election has delayed the process to form a new government after the successful conduction of historic parliamentary and provincial assembly elections. The Nepali Congress and Madhes-based parties have been advocating the Single Transferable Voting (STV) system for the election of National Assembly, while the CPN-UML and CPN-Maoist Centre are pitching for adopting majoritarian system. President Bhandari had held a series of meeting with political parties, seeking their suggestions on ways to end the deadlock, the report says.